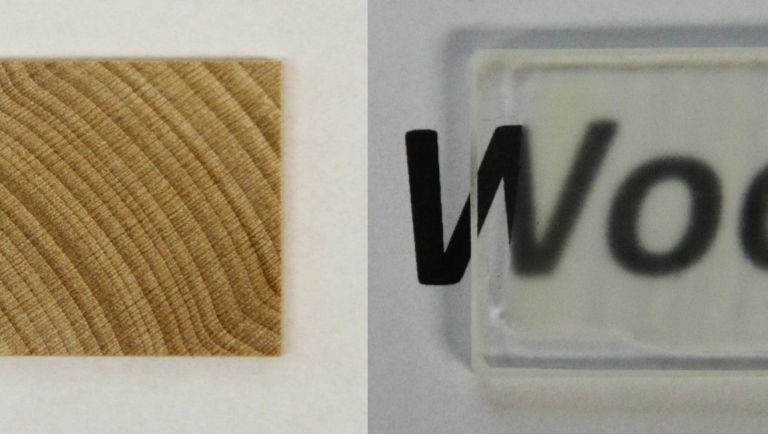 Researchers at the University of Maryland have been working on a new treatment that gives a regular piece of wood some rather interesting new properties including transparency, improved insulation and more. The block above may look like a piece of perspex or see-through plastic, but it really is just wood with two of its elements removed. So how did the researchers manage to pull it off? The scientists began by boiling the wood in water, sodium hydroxide and a number of other chemicals for two hours. This process removes lignin, the molecule responsible for giving wood its classic colour. The team then poured epoxy, a type of resin, which makes the wood four to fives times stronger. The end result is something that's not only stronger than glass but a much more effective insulator, too. Another interesting aspect of the transformation is the way the wood still retains its original grooves. Should this type of treated wood be used in the home such a design would carry light in much the same way these grooves carried nutrients through the wood itself. "In traditional material the light gets scattered," said Hu. "If you have this waveguide effect with wood, more light comes into your house."